Iran's Farsnews Arabic has an article onthe 49th anniversary of the 1969 Al Aqsa fire set by a crazed Christian, Denis Michael Rohan ,and - as is often the case - they call him a Zionist Jew "supported by Zionist gangs." This article also claims that Israeli officials forcibly stopped Palestinians from putting out the fire, and that the Palestinians managed to put it out themselves against the wishes of Israeli officials hours later using buckets. Muslims and Christians alike rushed to the mosque to quell the flames, but Israeli occupation forces prevented their entry. After short but fierce clashes, they made their way into the Noble Sanctuary and started to tackle the fire. After the fire extinguishers failed to work, they looked for sources of water but found the pumps broken and the hoses cut. They banded together quickly to form a human chain and used buckets and other small containers to bring water to the building. As fire trucks from the surrounding West Bank cities of Nablus, Ramallah, Al-Bireh, Bethlehem, Hebron, Jenin and Tulkarem arrived, the Israeli occupation forces also prevented them from reaching the scene, claiming that it was the Jerusalem Municipality’s responsibility to handle the situation. The fire burned for hours with flames reaching the windows just below the dome, before the blaze was finally extinguished. The suspicions that Israel was actively involved in planning and facilitating the arson attempt have never been disproved. Many also see the normalisation of Zionist intimidation, including Israel’s attempts to eradicate Palestinian heritage in the region, as the ultimate source of the mentality that led to this attack, and all others since. The Arabic Wikipedia page on the fire also claims that Israel cut the water supply to fight the fire. In a matter of minutes, hundreds of the old city's Muslim residents, including many children and teens, arrived at the temple mount. The masses of people began yelling and screaming, and whether intentional or not, interfered with the firefighters attempts to control the flames. The crowd managed to shut off the fire truck's water hoses. One individual went as far as breaking the only fire hydrant on the temple mount. In a matter of minutes the six Jerusalem based fire trucks exhausted their water supplies, with the lack of immediate water sources at hand, the crews were forced to cease fighting the fires for a matter of time. As a result, the fire spread towards other wooden areas within the mosque. 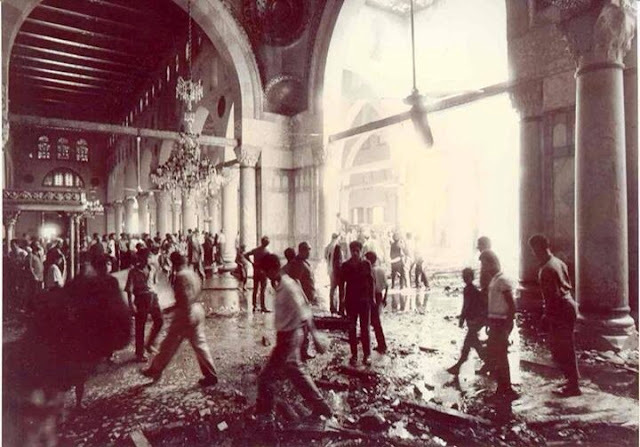 Soon after the fire began spreading, the screams of the masses of Muslim worshippers reached a fever pitch, with some of the youths yelling curses against the "Jews who burned our shrine," while others yelled "Arab Palestine." At 8:30 AM a thunderous sound was heard from within the mosque, followed by a rising black cloud of smoke. A large portion of the wooden roof had collapsed as a result of the fire, falling onto the mosque floor. The crash led to yet another wave of hysterical screaming, as it was described, followed by a wave of pushing and violent outbursts. 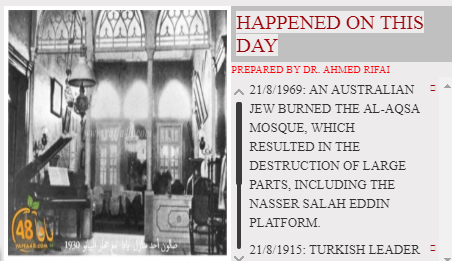 The fury reached its peak when then Jerusalem mayor, Teddy Kollek entered the burning mosque. Police officers rushed to protect him from any possible injury, but where quickly repelled by the angry crowd, who began raising their fists to ward off the officers. Furious Muslim youths also managed to push high ranking military officials from the temple mount. The officers chose to not to push into the mount, preferring to leave through the Mugrahbi Bridge, and avoid sparking another outbreak of violence. Kollek followed the officers in leaving the compound. One of the officers barely managed to escape the wrath of an angry woman, who raised her shoe above her head, intending to hit the officer. The firefighters finally managed to subdue the fire at 10 AM. The crazed Muslim crowd ended up impeding firefighting efforts, and some of the damage to the mosque can be attributed to them. The PA issued a statement saying that "the fire continues to this day against Islamic and Christian holy sites in Jerusalem."